5/8" x 150' Yale XTC12 12-strand Lowering Rope Hank. 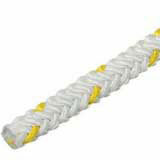 Yales's XTC-12 is a 12-strand rope that is a nubbier hollow braid offering low weight and excellent abrasion resistance. Built to be round and stay round. XTC-12 is a 12-strand single braid of polyester "Para-ep" Olefin. This all synthetic rope resists rot and mildew, and performs equally well in both wet and dry conditions.